Summary: Collagen is a natural skeletal protein and one of the body’s most abundant components. Collagen is a natural skeletal protein and one of the body’s most abundant components, accounting for nearly 80% of the body’s skin, muscle and connective tissue. 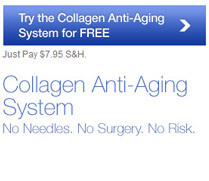 Collagen is a long, fibrous structural protein that is wound together in a tight helix. This helix is what gives collagen, and your skin, such great strength and elasticity. Numerous helixes bind together to form collagen fibers, which are woven together in our bodies like threads in fabric to form a framework into which new cells can grow. Without these fibers, the skin just cannot hold its shape, making it look saggy and less supple. By the age of 45, your body will have lost 30% of it’s collagen. Degradation and depletion of collagen in the skin is the main reason for the formation of lines, wrinkles and the appearance of aging. Collagen is affected by aging in two ways. First, our bodies actually produce less collagen as we age. It is thought that from the age of 25, your body loses collagen at a rate of 1.5% per year, so by the age of 35, your body will have lost 15% of its natural collagen and by the age of 45, 30% will be lost. This is when you really start to notice a change in your skin’s elasticity and texture. Second, collagen is particularly susceptible to free radical damage, a result of normal aging. Free radical damage to collagen causes the normally elastic and free-moving collagen fibers to become stiff and less mobile. Therefore, supplementation with pure collagen can reduce the signs of aging on our skin.